One of my early memories of the 80s includes a ‘Prabhat Pheri’ attended in Patiala close to my relatives home at Anardana Chowk, where Gurdas Maan sang a Shabad and we kids played the manjira, consciously trying to be on the beat. His dholak player used to be a friend of my uncle and it was just the time Gurdas Maan’s name had become a national rage post his ‘Dil Da Mamla’ song performance in the New Year Programme of 31st December 1980 (as I vaguely recall) and more hit songs later instantly winning over the Punjabi music lovers in Punjab and all over. 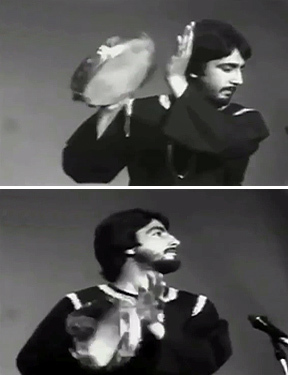 A couple of years later he made a successful debut as a singer-turned-actor in a Punjabi film MAMLA GADBAD HAI (named on his most famous song) in 1983-84 and one can say that probably the actual trend of casting renowned singers as lead heroes in films began with Gurdas Maan only in Punjabi Cinema. The following year he featured in an emotional family drama UCHA DAR BABE NANAK DA in 1985 with a cult title track that till date remains the most favourite in all Gurupurab Celebrations, Nagar Kirtans and Prabhat Pheries in India as well as abroad. The track never went out of circulation in this long time period and after 33 years, Maan has again recreated the same in his upcoming film NANKANA with an almost similar picturisation, minus some crucial elements (explained later in the article) coming full circle in his career of almost four decades. Before coming to the minute details of the track and its visualisation, would love to explain the meaning and ritual of ‘Prabhat Pheri’ to all friends who might not be familiar with the term or its exact interpretation. As suggested by the words, it’s an early morning spiritual/religious activity that is not confined to only Sikh religion to be precise. However its largely or commonly associated with Sikhism, since Sikhs practice it even in the present new-age world and have thankfully kept the tradition alive spreading the word of harmonious living as taught by the Gurus. Otherwise the term finds its roots in ancient religious history of our country and used to be a common practice in those times adapted by various sects. It actually means beginning the day from the early morning hours (Prabhat) with collective singing of verses remembering the Almighty. Both men and women get up before the sun rise, form a group and start making a round of their local area singing, chanting religious hyms/verses with a dholak and (traditional) percussion instruments. The ritual aims at spreading good vibes/vibrations in the morning as a spiritual start of the day and people keep joining in as the group passes their houses roaming in the local lanes. As a matter of fact, the ritual was also followed for other social activities apart from religion. And you can see an authentic example of the same in Govind Nihalani’s epic TV movie TAMAS (1988), wherein the freedom fighters regularly organize a prabhat pheri as a part of their independence movement with an aim to spread awareness among the people. In Sikhism its mainly practiced for a month before birth anniversaries of Guru Nanak and Guru Gobind Singh, that fall in winters in the months of November to January. At times its even seen on other selective occasions like Vaisakhi, but the two Gurpurabs remain the fixed events of the year for every local Gurdwara beginning their ‘Prabhat Pheries’. The procession begins from the Gurdwara around 4-5 am and then marches towards the particular day’s host house in the locality, singing Shabad Gurbani. A person holding the ‘Nishaan Sahib’ (The spiritual triangular flag) leads them all and a source of light is carried along to show the path in dark (before sunrise). In the modern times, a small public address system with a mike and speaker is also taken along, though that is not the purpose of these pheries to wake up people in the morning with their loud voice. As a result, its often seen people complaining about the loud voice too to the Gurdwara authorities. The host of the day arranges food and tea as ‘Prashad’ to serve the 'Sangat' as they all visit his premises. And the group sings a few shabads in his house getting seated for 20-30 minutes as per the time available. Due to the more demand, many a times two hosts are there for a single day and in that case the groups visits both the houses one after the other in their fixed time period. Around 7 am they all reach back the Gurdwara and the Prabhat Pheri comes to an end with the jaikara (spiritual slogan) “Boley So Nihaal, Sat Sri Akaal” recited by all. On the other hand, the new created track and its visualization misses every important element from the concept directed by Manjeet Maan. For instance, in the original, the march begins from the Gurdwara and ends on the Gurdwara too completing the ritual properly. Plus the group is also shown visiting two hosts for the day, singing hyms at their premises, taking the Prashad and then moving back to the Gurdwara so realistically. Whereas the latest recreation in film NANKANA shows just the group roaming through the village lanes singing the hymns and that’s it! Besides here we also have a lot of mashaals along the procession and the lead hero singing along the lead heroine giving it a typical filmy touch, away from the reality. Sharing another important observation about the lyrics of the track being discussed here, as a student of Khalsa College (Delhi University), we mostly used to sing “Ucha Dar Babe Nanak Da” in the regular Nagar Kirtans (as a participating college group) quite energetically. And till the early 90s, I was under the impression that its complete verses were actually sacred Gurbani extracted from the divine Sri Guru Granth Sahib. It was only during one of these yearly events in 1993 that our divinity professor informed us that the opening two lines were not any Guru’s bani, but individual poetry merged with sacred verses taken from the divine Granth forming the complete track. So where the first two lines “Ucha Dar Babe Nanak Da, Main Sobha Sun Ke Aaya” are a lyricist’s individual poetry, the rest of the verses are taken from a Shabad of Guru Arjan Dev as inscribed in Sri Guru Granth Sahib in Raag Bilaaval. Interestingly nobody was ever interested in stopping the practice of mixing the two (original and individual poetry) in the last century and it got even spread like fire when Ragis like Late Bhai Harbans Singh (Jagadhari Wale) and Bhai Chaman Singh Ji Lal got immensely popular for their impressive poetic verses composed and sung melodiously (mostly released by the leading audio company T-Series). Eventually it all got observed and objected in the new millennium (basically post the net revolution) and noticing the same, the Ragi Jathas began reciting only the original Gurbani in their programs, avoiding other poetic verses. So following the significant movement, any individual poetry is no more allowed in the Gurdwaras, except in the case of Dhaadi Jathas (singing ballads of warriors/veer ras poetry) and official Kavi Darbars where poets share their spiritual poetry written in praise of the Gurus or on major events of Sikh history. In a few words, in the present scenario many would object singing ‘Ucha Dar Babe Nanak Da’ in Prabhat Pheries and in Gurdwara premises for sure as the awareness is here about the differentiation between the actual bani and poetry. But as a film track it still seems to be allowed by the concerned authorities for some undisclosed reasons. Summing it all, it’s really nostalgic that the cult track from 1985 has been recreated and sung by the same artist in the same composition in similar settings post 33 years reaching a whole new generation. But I really wish its visualization was much more likable and realistic, righty guiding the youngsters, fulfilling the responsibility of a legendary veteran still active in the field, playing the lead hero of his films at the age of 61.